Fast Company’s FC/LA Creativity Counter-Conference is hosted at Rapt Studio’s Culver City Studio. 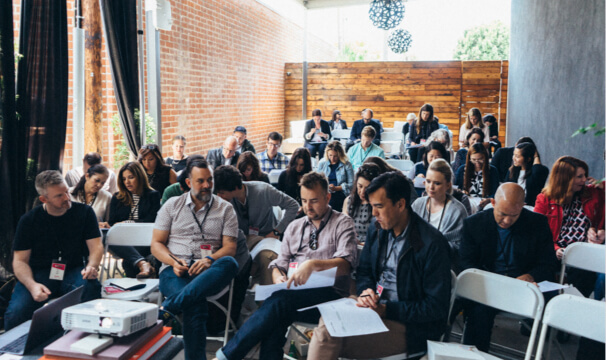 Last week, we hosted Fast Company’s FC/LA Creativity Counter-Conference at our LA Studio. The two day event began with Fast Tracks, which were day long neighborhood excursions curated by Fast Company. Attendees were able to choose one of five LA neighborhoods to explore. Each neighborhood featured access to the most intriguing and creative companies. We were honored to be selected as one of the Culver City stops. Our CEO and Executive Creative Director, David Galullo, spoke to a group of 50 on how great design transforms the way we work. The discussion began with a brief description on our company, brand essence, and Interdisciplinary approach. After going through a few case studies of recent projects, the attendees were split into groups for an Experience Map exercise. ‘Before, Experience, and Exit’ are the three main categories within the map. Each group was asked to think about what that looks like in terms of going to the dentist. What are the triggers, how is the arrival, what happens while you’re there, how’s the departure? It was a fun and engaging session, we’re looking forward to hosting more of this kind in the future. Thank you to all of the attendees and Fast Company! Stay tuned to our Twitter and Instagram for future events.